Many local libraries offer adult programs that feature notable community members. Yet rarely do they feature luminaries like Mikhail Baryshnikov and Aidan Quinn, who were among the many distinguished speakers presented by the Palisades Free Library over the past three years. 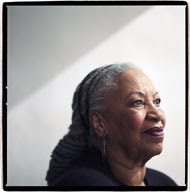 On May 31, the library, the smallest in Rockland County, will present Toni Morrison, the Nobel laureate and Pulitzer Prize-winning author, in conversation with Adam Gopnik , the award-winning essayist who has written for The New Yorker since 1986. The event is part of Palisades People: Sunday Symposia, established in 2006 to capitalize on the experience and insights of residents in the surrounding area. The series of discussions, held roughly every other month from September through May, is supported entirely by donations at the door ($10 is suggested). None of the presenters is paid. The series began with a dialogue between Mr. Baryshnikov and Didi Conn, the actress who played Frenchy in the films “Grease” and “Grease 2” and who is married to David Shire, a member of the library board and an Oscar- and Grammy-winning composer of scores for stage musicals and films. “Some of the equally interesting presenters haven’t been as high-profile, but are just as distinguished,” said Mr. Shire, who shared his own experiences as a composer in October 2007. For the full piece connect to NYT.